I spoke to a friend who spent time with Reb Fishele as a bochur. The man's father knew RFH from the Old Country. He always spoke very highly of him. I was the one who informed him on Motzoei Shabbos of the passing. His first words were: He was a Yid who never stopped bemoaning the fact that chibas Eretz Yisroel was torn from the fiber of Haredi society. then he went on to more traditional statements, like the fact that he knew all Sifrei Shu"T. Big gaon in Kabbalah as well. That he worked on all 40 Sifrei Rishonim that were published by the late Rabbi Chaim Moshe HaCohen Blau. Then he made a statement that most of you would not be כלים for, so I won't repeat it. I found it very telling. That a traditional Chassidic talmid chochom gaon of major proportions was to be remembered like that, first and foremost. I guess we know why that happened. As a former talmid of his son in Spinka Cheder I suppose I benefited from him as well. At least via kli sheni. I suppose I should post this slready. It's been weeks. I can always add on later. From you header it seems like you are saying that his Petirah was long overdue.. Maybe consider changing. Rumor has it that in his early days in Brooklyn reb fishel walked in the satmar shul on Bedford ave and gave shulem alecim to the SR, he asked him what is your occupation? he answered I'm learning! the SR (not knowing him from before) told him but you must find some work to sustain yourself, with that we lost rebbe fishel. Your friend sounds like a shvuntz when he says knows all siphrei Shut. Weird phrase. Clearly an unlearned fellow. "From you header it seems like"
why is it weired he was indeed an exceptional Talmud chucham, (he received the "hoyrua" from the kapisher ruv), and his "bemoaning the fact that chibas Eretz Yisroel was torn from the fiber of Haredi society." is correct to in my eyes, if I look back to what it was only here in America. It is a weird shprach. I don't doubt that he was big TC. But the use of that phrase denotes amaratzus. Sorry. "Anonymous Anonymous said...Your friend sounds like a shvuntz when he says knows all siphrei Shut. Weird phrase. Clearly an unlearned fellow." Sorry the only unlearned fellow is you. He knew almost all SHU"T that were published. Rav Fishel was one of a kind. Now you sound even more ignorant. "with that we lost rebbe fishel." Not quite, rebbe fishel lived two houses down from the SR, he had an exceptional library of seforim and the SR used to send over borrowing some rare seforim. he was a card carrying 'librarian' of reb fishels library so to speak. Hirshel: "Then he made a statement that most of you would not be כלים for, so I won't repeat it." who's loss are you? obviously reb fishel knew his place "Williamsburg" not union city or kiryat sanz, he looked completely out of place "and out of his learning curve" with the clean shaven agudistan at the siyum hashas. help me out here anyone, the constitution which they claim Jewish capitalist helped constructing, does not forbid a president to be rich! yet the Torah (the portion attributed to Yisroy! the goy) asks for שונאי בצע (no greedy people to apply) isn't that racist or anti semitic or something ? I did had some vague contact with RF, did You have any contact with him that you care to share ? D:You really have no idea what you are talking about. why not you don't like it? d: "He knew almost all SHU"T that were published"
talking shu't, did he knew all the fabricated "reshonim" too? could he differentiate !? "why not you don't like it?" Rav Michoel Ber was referring to bringing Rav Yonashan Steif into the picture. Both Rav Yonashan and the Pupa Rav supported an eruv in Williamsburg. It is laughable to derive much from Rav Michoel Ber's letter other than he simply did not want the responsibility on his shoulders. Nevertheless, he spent much time thinking about the construction of an eruv in Williamsburg, so much so that he even drew up maps of its possible boundaries. There is no difference between eruvin and any other halachic issue. Every rav has a right to do as he sees fit. There is no consensus needed. How much more so regarding a rav of RFH stature. He did know almost all shu"t. He had a photographic memory. Rav Fishel was also an expert on distinguishing writing styles. D: "Rav Michoel Ber was referring to bringing Rav Yonashan Steif into the picture. Both Rav Yonashan and the Pupa Rav supported an eruv in Williamsburg. " Exactly that's my point the may have wanted it but the knew that the Buck doesn't stop by them, they knew when they sat by meetings on it by the SR and the rebbe listened but didn't respond to them, and that was enough to them not to pursue it, know one knew better the SR z"l than Reb Yonasan!! !, that this question belongs to a Rav a rebbe. not to lomdim שבכל דור ודור עומדם עלינו. "know one knew better the SR z"l than Reb Yonasan!! !,"
And know one knew much better the SR than the pupar ruv z"l (my mohel MbP certified) who who became a dayan in the city of satmar under SR auspicious, the SR incuraged him and send with him 10 buchrim of his, to open a yeshiva in Pupa! (where it wasn't welcome) the puper Rav wanted to settle in Canada, and the SR told him you belong here in Williamsburg, there is many interesting insightful arguments between them, and to me both where amused by it, and respected each other in their authority he never stopped talking of SR dadlis, the pupar ruv was the spiritual descendant of the Baal keren l'Dovid! and the erev saga started there! don't get me started on that. "they knew when they sat by meetings on it by the SR and the rebbe listened but didn't respond to them"
Fiction, there never was such a meeting regarding Willamsburg. Stop rewriting history. The next part of your paragraph is discombobulated. Rav Yonashan was a rav. The Pupa rav was a rav. So they had a right and a chiyuv to state their opinion regarding an eruv. Eruvin does not belong to a rebbe, but only to a rav. you responses has nothing to do with what was intended to convey, it may a generation gap or a culture gap and I'm not in the mood to learn with you bartenira. so it's whatever, just keep up your comments, and you will get your answers sometimes from someone. D: "Eruvin does not belong to a rebbe, but only to a rav." Eruvin does not belong to a rebbe, but only to a rav." "למעשה התקיימה אסיפת הרבנים בענין זה, וכפי המסופר אמר הרה"ק מסאטמאר זצ"ל שדעתו הוא שלא לעשות עירוב, כיון שאין בי"ד קבוע ומרא דאתרא קבוע..וכו' וכו' וסיים: אינו אומר קבלו דעתי, וכל אחד יאמר מה שבדעתו, כל הרבנים שתקו, ואז נענה רבינו (מרן ר' חיים מיכאל דוב ווייסמאנדל ז"ל) ואמר: אם הרבי אינו מסכים בודאי שלא יעשו עירוב בלי הסכמתו, ובזה נגמר הדבר שלא לעשות עירוב. ע"כ -איש חמידות דף תי"ט-כ"
על מה ששאלני דאין בי"ד קבוע, עניתי, מדוע אוכלין בשר ויש חשש דנבילה וטריפה. ואמר לי תירוץ שאין מגלין וכו', ואמרתי שיהיו נמצאים בכל דור בע"ב יראי ה' בהצטרף גם רבנים יראי ה' ויעשו כולם אגודה אחת והוא הוא הבי"ד קבוע. And just for the record Rav Yonashan was a rav, and so was the Pupa Rav. Why did you leave out the part where we see that Rav Michol Dov was extremely involved with the construction of an Willasmburg eruv, notwithstanding the fact that he did not want the responsibility. As I mentioned, Rav Michol Dov's suggestion was to bring in Rav Yonashan Steif. Rav Yonashan was clearly involved in eruvin until the very end. I reiterate Ish Chamudos's stories are fabricated, and only lately. Rav Weissmandel was supportive of eruvin until the end, notwithstanding his Satmerer eineklichs revisionism. המעיין בדברי הרמב"ם בהלכות ממרים (שם, פרק ב' הלכה ב-ג) יראה דכל הדין שצריך ב"ד גדול בחכמה ובמנין לבטל דברי ב"ד חבירו, אינו אלא בב"ד "שגזרו גזירה או התקינו תקנה", אבל כבר מבואר ברמב"ם (שם הלכה א' ובנו"כ) בב"ד שאסרו דבר מצד הדין, יכול ב"ד אחר אף שהוא קטן ממנו לבטלו, וא"כ אם אסרו העירוב מחמת הלכה, יכול גם ב"ד קטן לחלוק עליהם. ועוד, דהרי כל אלו הרבנים שבאו לאוסרו מצד סייג, הרי חולקים על הרבנים שבאו לאסור מצד הלכה, כי הם נוקטים כהפוסקים דלית לן חשש רה"ר דאורייתא, ע"כ מה שכתב שלא יימצא בדורינו ב"ד הגדול מכל אותם גדולי הדור שהזכיר, אין לדבריו שחר. כי הרי אותם גדולי הדור שגילו דעתם דס"ל כהפוסקים דאין לנו רה"ר בזה"ז, הם מחולקים על אותם גדולי הדור שבאו לאסור מצד הלכה, א"כ לא היה דעה אחת ב"אותו בי"ד הגדול מכל אותם גדולי הדור" שהזכיר. D: "There is no consensus needed"
A: "those living in Williamsburg who had no contact with him"
Klausenburg-Square-Boyan The "troika" who fancied for themselves "Williamsburg" The Jerusalem of America", but instead they fled like the Palestinians did, are now trying to build an invisible wall (eyeRUV) around "Jerusalem". Hello Franz Kafka? D: "I reiterate that Chamudos's stories are fabricated,"
And I guess he colluded with gelbman who writes the same, plus that reb yonasan was at the meeting with reb micul Ber and that all conceded to SR, which was a fact for 40 years atleast, and by the way do you have any paper trail at all of reb yonasan's opinion on this? or its your opinion you iterate verses the facts on the ground. Reb yonasan an SR traded in halachas, SR asked him to up grade and start saying halal pesach eve, RY countered SR should up grade by starting to eat in the succoh on the 8th day, (they both gave in, SR to somehow..) SR asked him to accept shitas rabbeni tam! he gave in on motzei shabos, SR gave in on erev shabos! SR forbade weiner machine matzos, but he ate them after pesach, when it came to eiruv in Williamsburg he knew this is a decree of a Ruv A Rebbe! those where the days. Dovid Wednesday, July 12, 2017 11:38:00 PM. "Fiction, there never was such a meeting regarding Willamsburg. Stop rewriting history." So I know that there was such (numerous) meeting, and what shtzer rebbe has a secret. Reb MB writes and begs Rav Eisenstadt that he should "convince" reb yonasan on it! RMB was close to RY as a brother, and very close to the SR why the back the channel of Rabbi Eisenstadt? ask your self. RMB was clearly than for the eiruv, why will his children make up a meeting with the SR which resulted in defeating his goal? Why is he writing to Rabbi Eisenstadt, apologetically and asks him out of this whole controversy, RMB wasn't the faithful type, and neither are his children, what does the shatzer know about this. Williamsburg had a beth din קבוע enough it was called central rabbinical congress of the USA and Canada, they had plenty of authority! the SR was the head of the CRC and as such "he" didn't want to be the custodian responsible of the chilul shabos in essence and in spirit a large city eiruv will create!!! do "you" ???. דער עירוב אין וויליאמסבורג איז געבויט געווארן דורך ר' אשר גאלדהירש, א באיאנער חסיד, למעשה האלטן זיך רובא דרובא פונעם" וויליאמסבורגער עולם צוריק פון טראגן מיט'ן עירוב, און בלויז די באיאן'ער און די צאנז-קלויזענבורג'ער, און סקווירא חסידים באניצן זיך דערמיט. וד"ל"
פעמים מפי הגה"ח ר' אברהם חיים שפיצער ז"ל שבעת שנתמנה להיות דיין בקהילת וויען ביקר אצל מרן שר התורה ר' משה" פיינשטיין זצ"ל והדריך לו שאין לחשוש כלל לפסקי מופת הדור החזו"א כיוון שלא שימש ברבנות וד"ל"
That baal dimyon has no ne'emanus at all. Besides for which, it's comical when a Satamarer chooses Rav Moshe over the Chazon Ish. As usual it depends on when their opinion fits your agenda. You guys have no shame. ר' פישל ע"ה איז גיווען א "חבר" הבי"ד דקהל שארית הפליטה - קלויזענבורג, האט דער אב"ד אין די אנדערע חברים פונם בי"ד" אויך מתיר גיווען דעם עירוב אין וומסב"ג, צי איז דאס נאר גיווען א "דעת יחידאה" אונם בי"ד (י"א חצוף) זייערע"
Rav Fishel is equal to all the rabbanim in Willy combined. "And I guess he colluded with gelbman who writes the same, plus that reb yonasan was at the meeting with reb micul Ber and that all conceded to SR, which was a fact for 40 years atleast, and by the way do you have any paper trail at all of reb yonasan's opinion on this? or its your opinion you iterate verses the facts on the ground." Your a comic. Gelbman is the biggest redactor of history, in history. There was no meeting period. It is fiction concocted after the fact, and only lately. Yes there is a paper trail regarding Rav Yonashan, it's called teshuvos. Read them, they may educate you regarding the truth. However, but I doubt that you would change your mind. It's simple, you made up you mind, and do not want to be confused with the facts. "I left it out deliberately וכו there is pages of letters before this letter (as mentioned earlier in the comments) as proof that he reb Michel Ber z"l not in the capacity as ruv dyan or costodian of Williamsburg vs. real local rabbunim some who happened to be "rebbe's" to, was deeply involved behind the scene so to speak, and conceded to the local authority with grace as a graceful person he was, and went on with his other dealings with their unique relationship "
Irrelevant, there are pages upon pages of letters from Willamsburg rabbanim supporting an eruv there. "הרמב"ם כותב: "בית דין שגזרו גזרה או תקנו תקנה והנהיגו מנהג ופשט הדבר בכל ישראל, ועמד אחריהם בית דין אחר ובקש לבטל דברים הראשונים ולעקור אותה התקנה ואותה הגזרה ואותו המנהג, אינו יכול... אפילו בטל הטעם שבגללו גזרו הראשונים או התקינו אין האחרונים יכולין לבטל עד שיהיו גדולים מהם" וכו'. -רמב"ם הלכות ממרים ב, ב"
דהמעיין בדברי הרמב"ם בהלכות ממרים (שם, פרק ב' הלכה ב-ג) יראה דכל הדין שצריך ב"ד גדול בחכמה ובמנין לבטל דברי ב"ד חבירו, אינו אלא בב"ד "שגזרו גזירה או התקינו תקנה", אבל כבר מבואר ברמב"ם (שם הלכה א' ובנו"כ) בב"ד שאסרו דבר מצד הדין, יכול ב"ד אחר אף שהוא קטן ממנו לבטלו, וא"כ אם אסרו העירוב מחמת הלכה, יכול גם ב"ד קטן לחלוק עליהם. ועוד, דהרי כל אלו הרבנים שבאו לאוסרו מצד סייג, הרי חולקים על הרבנים שבאו לאסור מצד הלכה, כי הם נוקטים כהפוסקים דלית לן חשש רה"ר דאורייתא. הרי אותם גדולי הדור שגילו דעתם דס"ל כהפוסקים דאין לנו רה"ר בזה"ז, הם מחולקים על אותם גדולי הדור שבאו לאסור מצד השקפה, א"כ לא היה דעה אחת ב"אותו בי"ד הגדול מכל אותם גדולי הדור" . לפני איזה שבועות קבלתי מכתב מן הגאון מוהר"ר יצחק מאיר ראפפורט הי"ו מערער על אותו מכתב שכתבתי להדר"ג שליט"א זה זמן רב, הנני מעתיק ממכתב הנ"ל מה שנוגע לענינא, וגם מה שכתבתי להרב הגאון הנ"ל על דבריו"
The rest of the claims are fiction. "ר' שמואל זאנוויל גאלד ז"ל א שכן פאר ר' פישל, א ת"ח שישב באורייתא תמיד בהתמדה רבה וביסורים נוראים אין אויך גיווען א יר"ש באמת, א מונקאטשער תלמיד וויא ר' פישל איז גיווען, אבער זה פנה לכרמו וזה פנה לקלויזענבורג. אתמהה"
you ave such litlle hasuga in torah to compare reb shmiel zanvel gold to the great goan reb Fishele..
By whom did Reb liebish liezer sit and breathe his torah or who gave shimush for R Yisroel CM son? Of course you left it out deliberately. Only because it proves that Rav Michol Ber was extremely involved with the issue of establishing an eruv in Willamsburg, notwithstanding his reluctance to be the one to take responsibility for it. In any case, your arguments are empty. Who cares if Rav Michol Ber was a rav or not. Many rabbanim in Willamsburg supported an eruv. And know one knew much better the SR than the pupar ruv z"l (my mohel MbP certified) who who became a dayan in the city of satmar under SR auspicious, the SR incuraged him and send with him 10 buchrim of his, to open a yeshiva in Pupa! " what a bunch of hogwash??? They state (Yalkut Michtavim, pp. 34-35; see also Ish Chamudos p. 420) that many people claimed to have heard the following story from Rav Avraham Chaim Spitzer shlita. In the year 1949 or 1950, the Satmar rebbe was at a bris in the Yeshivah of Nitra in Mount Kisco, NY. Later the Satmar rebbe locked himself in the Yeshivah’s seforim room with Rav Michoel Dov and debated the merits of a (Williamsburg) eruv the entire night. Rav Spitzer relates that at approximately three o’clock he awoke and overheard the conversation. After some debate regarding a Tosfos in Eruvin, the Satmar rebbe declared that he would never permit an eruv here (Williamsburg) since roughly sixty years ago an eruv was established (in Manhattan by Rav Yehoshua Seigel zt”l) with approbations from Gedolei Yisroel that utilized bridges (elevated train tracks). These elevated tracks were later demolished, but nevertheless people continued to carry (in Manhattan). Following this, the Satmar rebbe repeated that he would never agree to an eruv here (Williamsburg). They add that Rav Spitzer claimed that he remembers the story as if it happened today. This tale in Yalkut Michtavim is cited as primary testimony that the Satmar rebbe was opposed to eruvin anywhere in New York. • This story is pure fiction. Rav Seigel utilized the natural riverbanks for three sides of the boundaries of the eruv and on the fourth side, the Third Avenue El. The only mechitzah that the Satmar rebbe could have been referring to that was later demolished was the Third Avenue El. However, the Third Avenue El was not demolished prior to 1950 as this story charges but actually August 3, 1955, as reported by the New York Times. Just as this fundamental tale regarding the Satmar rebbe in Yalkut Michtavim is a fabrication so too all stories contained therein should be treated as such. • Way after this supposed story happened it was well known that Rav Michoel Dov supported an eruv in New York. Even in 1956 and 1959 the Shatzer rebbe, published in his sefer Kuntres Tikkun Eruvin Manhattan that Rav Michoel Dov supported an eruv in New York. • Even after this supposed story took place Rav Michoel Dov was included on a kol korei of rabbanim  who supported a Manhattan eruv. • Rav Michoel Dov wrote a letter (Toras Chemed, siman 3, dated September 8, 1951) in support of an eruv even after this supposed story happened. Clearly he continued to support an eruv after this imaginary story happened. They state (Ish Chamudos, p. 420), without attribution, that at a conference of rabbanim regarding establishing an eruv in Williamsburg, the Satmar rebbe expressed his objection to an eruv. After hearing the Satmar rebbe’s opposition, Rav Michoel Dov, then and there, acceded to his wishes. • Even the Yalkut Michtavim, which has added many fictional rabbanim conferences regarding the Willamsburg eruv, never claimed that Rav Michoel Dov participated in any assembly regarding eruvin. The first fictional conference mentioned in Yalkut Michtavim in which the Satmar rebbe participated was around late 1957 to 1958, and they did not mention that Rav Michoel Dov was present. (It’s important to remember, as well, that Rav Michoel Dov was no longer alive by late 1957.) Clearly this conference, as stated in Ish Chamudos, is fiction. • Even after this supposed conference took place, Rav Michoel Dov was included on a kol korei of rabbanim  who supported a Manhattan eruv. • In the allegation above, they claim that Rav Michoel Dov was apprised by the Satmar rebbe himself, somewhere between 1949 and 1950, that he objected to a Willamsburg eruv. Why would Rav Michoel Dov need to accede to the Satmar rebbe’s wishes at this later conference of rabbanim if he previously desisted from being involved with eruvin? "the puper Rav wanted to settle in Canada, and the SR told him you belong here in Williamsburg"
They state (Ish Chamudos, p. 420), without attribution, that one of Rav Michoel Dov’s talmidim was driving his rebbe from Mount Kisco to New York, and in middle of the journey, Rav Michoel Dov saw that a bridge [elevated track] that could have been used for an eruv [through pi tikra] was being removed. At that time, Rav Michoel Dov acknowledged that the Satmar rebbe was correct when he declared that since in America they are constantly altering the infrastructure, we cannot use these structures for the boundaries of an eruv. • It is curious that the editor of Ish Chamudos left out the name of this talmid, and I think I know why. This story was originally published in Di Tzeitung (November 26, 1999 p. 45), and the talmid’s name was given as Rav Libush Gottesman. However, in Chai Anochi LeOlam (p. 72) Rav Libush was cited as declaring that this story never happened. What is even more telling is the fact that Rav Libush was quoted in Ish Chamudos ― that his rebbe gave him the responsibility to write a protocol of all the shitos that would allow an eruv to be established in Brooklyn ― on the same page where this tale is mentioned, but yet they failed to associate him with the story. Clearly the editor knew that this story is fictional, but nevertheless chose to mention it to further his own personal agenda against eruvin. • Even after this supposed story took place, Rav Michoel Dov was included on a kol korei of rabbanim  who supported a Manhattan eruv. The biography Ish Chamudos (at least regarding the issue of eruvin) is a redaction of history and is an embarrassment to Rav Michoel Dov’s name. As can be discerned from the above, Rav Michoel Dov considered the establishment of a Brooklyn eruv of extreme importance and campaigned to bring his plan to fruition. Instead of embracing this fact, the writers of this book capitulated to the current trend to be anti-eruv and rewrote their ancestor’s true desires. Reb yonasan an SR traded in halachas, SR asked him to up grade and start saying halal pesach eve, RY countered SR should up grade by starting to eat in the succoh on the 8th day, (they both gave in, SR to somehow..) SR asked him to accept shitas rabbeni tam! he gave in on motzei shabos, SR gave in on erev shabos! SR forbade weiner machine matzos, but he ate them after pesach, when it came to eiruv in Williamsburg he knew this is a decree of a Ruv A Rebbe! those where the days." In which fish market did they trade and barter? Dovid Saturday, July 15, 2017 11:52:00 PM "And just for the record Rav Yonashan was a rav, and so was the Pupa Rav." follow the money! "location- location- location"
I would consider RY Steif and the Puper Rav z"l as one of the biggest "chasidim" who regularly consulted with SR came to his טיש regularly, and never sided in anything against his will, to think that these two tzadikim will side against him on Eiruv! is absurd. The SR asked RY who came regularly to his prayers why are you here? don't you have a congregation to attend to! RY quipped; "I'm on 'urlob' Vacation now" once SR asked him when he saw him "again you on vacation" ?, even more so the puper ruv, who lived most of his life in the perimeter of the SR, but was considered a "belzer chusid" in the eyes of the belzer rebbe RA a"h, Therefore out of respect the SR didn't "accept" him as a "cusid" although he was one with the full meaning of the word, he to would sit for long hours at SR טיש'ן and wouldn't leave town or returning from out of town without his blessing, of course he wouldn't contradict the SR, it's childish to think differently. The בשר כשר industry in america belonged to individuals and rabbi's who controlled it like the Mafia did, they where actually chazir treif, when the ungarishe came here and start making inroads to break the בשר כשר industry of America, many "beneficiaries" of the "kosher-treif" meat industry were understandable up set. Rabbi Tibor Stern (a great personality) told me he tried to visit the SR in Miami Beach but he was turned down, what he didn't tell me Thathe who defended Hebrew National in the the US Court's when the "government" sued them for selling Trief! Slandered the than Sigeter Ruv in writings and the Batterer ruv, for not being good enough!, in the the end he z"l was and stayed the "problem" for Hebrew National. "With the departure of Hebrew National’s longtime in-house rabbi, Tibor Stern, who died in January, and the decision to seek outside kosher supervision, the company is showing signs of regaining the confidence of some corners of the kosher community." D: "they may educate you"
"In 1901 when the rabbanim Hagaon Harav Tzvi Yechezkel Michelzon zt”l, one of the main rabbanim of Warsaw, and Hagaon Harav Yosef Levenstein zt”l, Av Bais Din of Serotzk, agreed that halachically it was permissible to establish an eruv there (see Chavalim BaNe’imim, 3:17 and Tirosh VaYitzhar, siman 73). In 1905, an eruv was established by Hagaon Harav Yehoshua Seigel zt”l, the Chief Rabbi of Kehilas Yisroel and one of the most noteworthyposkim of that era living in New York (Otzar Zichronasi, pp. 118, 352). At the time, Rav Seigel published a kuntres, Eruv V’Hotzaah, in which he established the halachic underpinning for an eruv in New York, guidelines that are still pertinent today." On that basis of strictly "halacha" RY z"l wasn't oppose, on all other squally "halachas" involved in practicality to actual build it and maintain it which includes informing the weekly status of the eiruv, meaning every Jew in that perimeter mosaic of the tri-state are should be informed of the eiruv status, and if he wasn't inform who's responsibility is it ? that among many other questions muted the issue. PS: so far I don't find you more authentic than gelbman, stay focused. exactly c"s was ruv in Pressburg. and reb fishel who woke up 40 years late that he is ruv in "Williamsburg" is not, Williamsburg did fine and will do fine without reb fishel 10,001 pe'sak'im, even the Klausenburger's don't obey his 'pesukim' . I'll not debate with you on comparing personal characters traits of each 'individual' individually. However he was from munkatch, and got his semicha from Kapusher Ruv a true munkatcher cusid, that renders him a Munkatcher. you don't need to be a ruv at at all let alone "all combined" to know "hilcus eiruv" RMB wasn't a Rav at all and he knew it pretty well, we know reb fishel well and what's behind it, he didn't invent anything new about the eiruv in NY its an old topic, however I haven't noticed that any one gave him the authority in Williamsburg where there is an established, התאחדות הרבנים. involved in thousands of local issues, he "maybe" had authority to change his local kehila but not to impose (or confuse) an entire established community, he wasn't a "practicing" Rav either, this sounds more obstruction then any other ehrlucher ruv I know did, perhaps he wouldn't paskun so much, or wouldn't be such "great" Talmud cuchem than "all combined" (tipush einer) all would be better of. TV:"that made him the godal hadoir"
Which newspaper declared him as such? "So I know that there was such (numerous) meeting, and what shtzer rebbe has a secret." It is difficult to answer you for many reasons. You constantly change names, and use sock puppets. You constantly argue half-truths. Your writing style is typical of Satamer newspapers. Full of half truths and all over the place. I suggest that you take a job there (or maybe you are already did). In any case, there never was a claim until lately that there was a meeting regarding an eruv in Willamsburg. This is proof that all these claims are after the fact. Besides for which, these claims are obviated by the written teshuvos. ר' פישל הדיין, האט גיפסקנ'ט אז על פי "הלכה" אסור מ'טאר נישט בענטשן ברכת המזון ביי שלש סעודות כל זמן ס'איז נאך שבת" (כשיטת ר"ת)!, ר' פישל אוסר לכסות הכובע בשעת גשמים בשבת בפלעסטיק, אף שהרב מקלויזענבורג הגאב"ד התיר, אין אללע טראגן דארט פלעסטיק כדעת הגאב"ד ולא כדעת ר' פישל הדיין ! (חוץ מבניו שיחי', ואומרים שזו הטעם שרוצה עירוב שמה), הגאב"ד אוסר את העירוב בווילאמסבורג, ור' פישל הדיין התיר! אין אללע פאלגן וויא ר' פישל הייסט נישט ולא כדעת הגאב"ד! הלא דבר הוא!? אתמהה"
Right, this is the difference between Kluasenburg and Satmar, a dyan does not need to follow the rebbe. However, you are lying regarding eruvin. The Klausenburger did not object to an eruv. In any case, everyone in Klausenberg asked Rav Fishel sheilos. "Reb MB writes and begs Rav Eisenstadt that he should "convince" reb yonasan on it! RMB was close to RY as a brother, and very close to the SR why the back the channel of Rabbi Eisenstadt? ask your self. Why is he writing to Rabbi Eisenstadt, apologetically and asks him out of this whole controversy, RMB wasn't the faithful type, and neither are his children, what does the shatzer know about this." What a silly argument. RMBW was just recommending that RTE should bring in RYS because he considered RYS the right person for the job. RTE was not as close RYS as was RMBW. The Shatzer wrote about it at the time, not like all these revisionist who are johnny-come-lately. "Williamsburg had a beth din קבוע enough it was called central rabbinical congress of the USA and Canada, they had plenty of authority! the SR was the head of the CRC and as such "he" didn't want to be the custodian responsible of the chilul shabos in essence and in spirit a large city eiruv will create!!! do "you" ???." So why did the Satmar rebbe suggest that this would be an issue to the Shatzer rebbe? The answer is simple because this was one of the arguments suggested by the litvshe rabbanim, and the Satmar rebbe threw at the Shotzer all their arguments. This issue is where you Satmarer fall for the Bick ruse. These arguments are not from Chasiddim. All large cities had eruvin in the heim why should NYC be any different? You guys fell hook, line, and sinker for Rav Bick's bubbe meises. "exactly c"s was ruv in Pressburg. and reb fishel who woke up 40 years late that he is ruv in "Williamsburg" is not, Williamsburg did fine and will do fine without reb fishel 10,001 pe'sak'im"
"involved in thousands of local issues, "
thousand of golden flow milk and juice cartons..
did Reb Fishele have to ask Itzu glick how to pasken? Half of Satmar dont follow CRC for their own reasons, but did reb fishele had to call Itzu everyday how to learn the sefer hamichtam on Shabos?? "However he was from munkatch, and got his semicha from Kapusher Ruv a true munkatcher cusid, that renders him a Munkatcher. He was a spinker by birth, and all his life you heard chakal yitzchok only ..
"The eiruv saga in Williamsburg got rekindled after 40 years, when the local zonings there where changed, and the big honchos who invested in "new Williamsburg" real estate, started to use "the eiruv" as a selling point.. which paid of to them handsomely.. think¡¿"
"I would consider RY Steif and the Puper Rav z"l as one of the biggest "chasidim" who regularly consulted with SR came to his טיש regularly, and never sided in anything against his will, to think that these two tzadikim will side against him on Eiruv! is absurd." Yea, the where the biggest Chasidim, and I have a bridge for sale. In any case, the Satmar rebbe was not opposed to eruvin. All the claims otherwise are fiction and historically don't follow. "In 1949 harav Rav Tzvi Eisenstadt zt”l, started to establish an eruv that included the whole Manhattan,the Shatzer Rebbe, z"l was on that committee, that eiruv doesn't exist anymore, but years later after its destruction people didn't know that they where still carrying on as if it still existed, Why? asked the SR the Shatzer Rebbe? Isn't it because there isn't a bet-din קבוע in our community with responsibilities to inform the masses to avoid continues chillul shabos? the shatzer tried to counter because there is no bet-din קבוע therefore you could establish your own kosher "questionable" slaughter house with out the bet-din's oversight ! לכבוד עצמו הוא דורש"
You see this is where your tall tales falls apart, because it doesn't follow. It would be prudent of you to stop shooting from the hip. Then again, you are a typical specimen of the tale spinners in your culture. Tell a lie enough times and your minions will believe it. RTE's eruv was not realized until 1962, therefore, your entire pshat and lumdos is false. When the Shotzer rebbe came to RYT it was to get his haskamah to establish an eruv. This piece of Igros Moshe is proof positive that RMF never gave a psak din barur kneged an eruv (unless of course you want to believe kol koreis). "On that basis of strictly "halacha" RY z"l wasn't oppose, on all other squally "halachas" involved in practicality to actual build it and maintain it which includes informing the weekly status of the eiruv, meaning every Jew in that perimeter mosaic of the tri-state are should be informed of the eiruv status, and if he wasn't inform who's responsibility is it ? that among many other questions muted the issue." "exactly c"s was ruv in Pressburg. and reb fishel who woke up 40 years late that he is ruv in "Williamsburg" is not, Williamsburg did fine and will do fine without reb fishel 10,001 pe'sak'im, even the Klausenburger's don't obey his 'pesukim'." So much narishkeit. First of all, there was one main rav in Pressburg, but Willy does not only have one rav. Therefore, every rav has a right and a responsibility to establish an eruv. Second, most of RFH pesakim are followed in Klausenberg. Stop concocting up stories. "you don't need to be a ruv at at all let alone "all combined" to know "hilcus eiruv" RMB wasn't a Rav at all and he knew it pretty well, we know reb fishel well and what's behind it, he didn't invent anything new about the eiruv in NY its an old topic, however I haven't noticed that any one gave him the authority in Williamsburg where there is an established, התאחדות הרבנים. involved in thousands of local issues, he "maybe" had authority to change his local kehila but not to impose (or confuse) an entire established community, he wasn't a "practicing" Rav either, this sounds more obstruction then any other ehrlucher ruv I know did, perhaps he wouldn't paskun so much, or wouldn't be such "great" Talmud cuchem than "all combined" (tipush einer) all would be better of." More nariskeit. You don't know hilchos eruvin from a hole in a wall. Eruvin is complicated, and the fact that RMBW new it well does not suggest otherwise. There was no rav in our times who had such a mastery of the sugyos and the teshuvos regarding eruvin, as RFH. Even the short letter he wrote supporting the original BP eruv, regarding the mitzva of eruvin, has fascinating info, and demonstrates his gaonus. Eruvin does not belong to any rav or kehilla. No rav needs to be given the authority in any town to build an eruv, just like he does not need to be given the authority to build a mikvah. Please get this through your thick skull. It would be comical if it wasn't so sad if you really believe what you said, RFH was not a practicing rav. Your pathetic. "perhaps he wouldn't paskun so much, or wouldn't be such "great" Talmud cuchem than "all combined" (tipush einer) all would be better of." You see, you don't know what you don't know. The only tipshus is that you involve yourself in things that you don't know much about. You have no idea what Rav Fishel added to the issue of large city eruvin. From the the proofs that he cited regarding halacha kdivrei hameikil in regards to mechitzos to the mare mekomos that he unearthed regarding the number of mechitzos needed. He was unparalleled in our times. "Yes indeed they were Rabbunim who didn't bow for RMB pressure when he tried to convince RY with his לומדות through an intermediate, but of course they weren't convinced, there is no written פסק or paper trail otherwise I think, only a letter that RMB was "trying" to involve RY for political reasons.. in his letter he writes:"
What are you talking about, there is a lengthy teshuvah from RYS allowing an eruv. "you don't need to be a ruv at at all let alone "all combined" to know "hilcus eiruv" RMB wasn't a Rav at all and he knew it pretty well, we know reb fishel well and what's behind it, he didn't invent anything new about the eiruv in NY its an old topic,"
D: "Rav Michoel Dov was included on a kol korei of rabbanim. RMDBW and his crew must of have extra time to examine all the bridges and infrastructures before each shabos, and if a question arises, to collect the bet-din before shabos to examine and to agree on the שאלה and to inform the 6 million jews of NYS before shabos on their conclusion. In New York city Bridges and tunnels dont get demolished on a weekly basis..
was Satmar ruv in the matzoh bakery under his hashgocha for 12 hours daily from chanukah till erev pesach???? where is this letter printed? Like a robot you quote people and personalities who permitted and wanted the eiruv (even that SR himself wanted it, they say) So why?? didn't "they all" do it? what did they want from "him" his הסכמה his topographic knowledge? why non of these forces did it for 40 years, the question isn't who didn't agree with the halach ? but rather why did they all waited so long? Did they wanted "him" to do it for "them" even if he didn't wanted it? his closest aide Reb Yossel Ashkenazi claims he did want a eiruv, why did he say that?? Why did Reb Chezkel Roth who was handpicked from Yerushaliem by Satmar ruv to be Dayan in Satmar NY ,(I think before the stroke) why does he claim Satmar ruv was for the eiruv? Why is he saying that Satmar ruv was for the eirev?? "RMDBW and his crew must of have extra time to examine all the bridges and infrastructures before each shabos, and if a question arises, to collect the bet-din before shabos to examine and to agree on the שאלה and to inform the 6 million jews of NYS before shabos on their conclusion." Absolute stupidity. That's why rabbanim have mashgichim. Did the rabbanim who give hechsherim on meat go every day? This proves nothing, and is typical of Satmar style arguments. As a matter of fact his pirush on Zichru Toras Moshe was written prior to his teshuvah and his letter to the Shatzer rebbe. This proves that he either was not concerned with the Satmar rebbes opinion or he believed that the SR would not have an issue with an eruv. "Like a robot you quote people and personalities who permitted and wanted the eiruv (even that SR himself wanted it, they say) So why?? didn't "they all" do it? what did they want from "him" his הסכמה his topographic knowledge? why non of these forces did it for 40 years, the question isn't who didn't agree with the halach ? but rather why did they all waited so long? Did they wanted "him" to do it for "them" even if he didn't wanted it?" No one says the SR wanted an eruv, but he was definitely not opposed to one. All the other rabbanim wanted and actively tried to establish an eruv, but because of the need to erect tzuras hapesachim (at that point in time) they could not do so easily. All eruvin in America that were mentioned up until then, where making use of existing structures. "הרה"ג ר' משה יוסף שיינערמאן פון פלעטבוש האט שטארק ארונטערגעריסן דעם ר' בן ציון וואזנער פון מאנסי וואס גיבט דעם הכשר אויפן אזויגערופענעם עירוב אין פלעטבוש"
Wow your scraping the bottom of the barrel. Who cares whats the last psak that he issued. "Hirshel you're invaded with some dovid podcast spewing revolving coded answers.. כ'האב נישט קיין כח"
No you do have koach. You posted many comments under different names, probably more than I did. Its more likely that you don't have what to answer when I lay bare your lies. E.g. 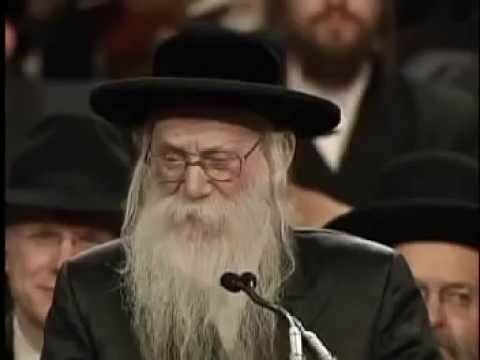 your revisionist argument: "In 1949 harav Rav Tzvi Eisenstadt zt”l, started to establish an eruv that included the whole Manhattan,the Shatzer Rebbe, z"l was on that committee, that eiruv doesn't exist anymore, but years later after its destruction people didn't know that they where still carrying on as if it still existed, Why? asked the SR the Shatzer Rebbe? Isn't it because there isn't a bet-din קבוע in our community with responsibilities to inform the masses to avoid continues chillul shabos? the shatzer tried to counter because there is no bet-din קבוע therefore you could establish your own kosher "questionable" slaughter house with out the bet-din's oversight ! לכבוד עצמו הוא דורש"
To which I answered: You see this is where your tall tales falls apart, because it doesn't follow. It would be prudent of you to stop shooting from the hip. Then again, you are a typical specimen of the tale spinners in your culture. Tell a lie enough times and your minions will believe it. continue.. until you run of breadth. Dovid: The Klausenburger did not object to an eruv. D: and demonstrates his gaonus. Big D: stop shooting from the hip. In 1949, the Amshinover Rebbe zt"l urged Hagaon Harav Rav Tzvi Eisenstadt zt”l to establish an eruv that included the whole Manhattan. Rav Eisenstadt spent days investigating the Manhattan waterfront and concluded that it was bounded by man-made walls [mechitzos b’y’dai adam] and an eruv could be established (Minchas Tzvi, siman 4). to which have do yo belong too! Dovid: "the difference between Kluasenburg and Satmar, a dyan does not need to follow the rebbe"
D: "to the issue of large city eruvin"
Big D: "stops shooting from the hip." 10,000 mamas pushing carriages on Lee ave. to the shviger shabos after noon, or pesach after the Seder going home.. before you know it Lee ave and Bedford ave. must be closed off to vehicle traffic shabos it's dangerous says NYPD, the goyim scream Gevald! the toddlers (first) will scream back SHABOS!!!! you know the rest. "if hilchos eruvin was so simple why didn't the SR know it"
Hershel Weber had to come back a few times until he got the genius answer that the roads need to be mefulash and shishim ribo is dependent on the street. These are issues that anyone who learnt the inyan could have answered on the spot. Inyanei Orach Chaim was not his strong point. "דברי יציב: ואולם במה הדברים אמורים, כשכל בני העיר דעתם נוחה בתיקין העירוב ומערבים החצרות יחד, אבל כשכמה מאנשי העיר מתנגדים ומוחים בעשיית העירוב, הרי אינם מקנים ומערבים את רשותם, ואסור להוציא ולטלטל שם כדין חצר שאינה מעורבת... ובנ״ד הרי יש רבנים ות״ח שמתנגדים ומנמקים זאת בטעמים ע״פ הלכה.. והוסיף עוד, שלא מועילה בכה״ג שכירת רשות מיד מושל העיר - כיון שלא מצינו קולא זו אלא בעכו״ם או באינו מודה בעירוב אנו אין לנו להקל בישראל המודה בעירוב, ואף דקיי״ל להקל בעירובין מ״מ אין לנו לגבב קולות ע״ג קולות, ולכן כיון שיש מאנשי העיר שמוחין בעשיית העירוב ל״מ לזה שכירות רשות מהאדון כנלענ״ד ברור. " Stop lecturing Klausenberger Chasidim what to do. להלכה למעשה, הרי כל החשש הנ"ל אינו נוגע לענינינו, כי כ"ק האדמו"ר מקלויזנבורג כתב עוד דברים וז"ל, "ואולי ס"ל להגר"ש קלוגער, שגם שרי העיר מחמת דינא דמלכותא חשיבי כבעה"ב וכפי שביאר הר"ן בשם התוס' בנדרים דף כח מפני שהארץ שלו וכו' עי"ש, ולפי זה צ"ע אם שייך הך גדר גם בשרים שבזמנינו", עכ"ל. היוצא לנו מדברי כ"ק האדמו"ר מקלויזנבורג זצ"ל, שאם חשיבי השרים שבזמנינו כבעה"ב מחמת דינא דמלכותא, אזי תפיסתם תפיסה גמורה, וא"כ סגי אפילו לישראל לשכור הרשות מהם. וכהיום שנתברר כוחם של שרי המלוכה, לא די שיש להם זכות לקחת נכסים מן העוברים על חוקי המדינה, אלא אפילו אם הם רוצים לשנות וליפות את העיר, או להרחיב את הדרכים, הרשות בידם לסלק את בתי התושבים (עי' גינת ורדים כלל ג' סימן כב, שואל ומשיב מהדו"ת ח"ב סי' סב), ואין לך תפיסת יד גדול מזה, וזהו הוכחה על בעלותם (כלשון הר"ן והריטב"א עירובין סה ע"ב), ולפי"ז פשוט דסגי ומועיל שכירות הרשות מהם. "וזה לשון הגר"י בעלסקי: הרב מדעברעצין שהיה מגדולי הרבנים בדור הקודם, והיתה לי הזכיה הגדולה לדבר עמו בכל עת. ושמעתי מפי קדשו; שכשבא לאמריקה ולא היתה לו שום פרנסה, הוצע לו לסייע לבנות עירוב במנהטן. ושאל את פי האדמו"ר מסאטמאר, שאמר לו: ״אפילו אם אין לך ׳פעני׳ אחד, אסור לך לקחת תפקיד כזה״. עוד אמר לו; שלדעתו זהו אחד מהנסיונות של דור זה, וברכו שהקב״ה יספק לו פרנסה אם יעמוד בנסיון. כן שמעתי ממנו בעצמי"
Another of R' Belsky's bubbe meises. דהנה בדרשתו לפני בחורי תו"ד, כאשר כ"ת סיפר להם מעשיה זו, הוסיף אז פרט שלא הזכירו כאן בתשובתו הגדולה, והוא פרט חשוב מאד הנוגע לענינינו, שהרב מדעברעצין זצ"ל עבד אצל הרה"ג רמ"מ כשר, לסייע לו בעריכת ספרו "תורה שלימה" במציאת מראי מקומות וכו'. והואיל ופרנסה לא היה לו מזה שעבד אצלו רק כמה שעות בשבוע, הציע לו הרב כשר תפקיד נוסף לסייע לו לבנות העירוב במאנהעטען. NU: "Belzer ruv is the biggest heretic since Yeruvom... what more party line right wing satmar can you get"
Atleast you got this one right. D: "This issue is where you Satmarer fall for the Bick ruse." "no rav needs to be given the authority in any town to build an eruv"
"you can differ with your rebbe"
knob: "you can differ with your rebbe if your pesak is based on solid ground"
"דברי יציב: ואולם במה הדברים אמורים, כשכל בני העיר דעתם נוחה בתיקין העירוב ומערבים החצרות יחד, אבל כשכמה מאנשי העיר מתנגדים ומוחים בעשיית העירוב, הרי אינם מקנים ומערבים את רשותם, ואסור להוציא ולטלטל שם כדין חצר שאינה מעורבת... ובנ״ד הרי יש רבנים ות״ח שמתנגדים ומנמקים זאת בטעמים ע״פ הלכה.. והוסיף עוד, שלא מועילה בכה״ג שכירת רשות מיד מושל העיר - כיון שלא מצינו קולא זו אלא בעכו״ם או באינו מודה בעירוב אנו אין לנו להקל בישראל המודה בעירוב, ואף דקיי״ל להקל בעירובין מ״מ אין לנו לגבב קולות ע״ג קולות, ולכן כיון שיש מאנשי העיר שמוחין בעשיית העירוב ל״מ לזה שכירות רשות מהאדון כנלענ״ד ברור. -דברי יציב או״ח סי׳ קעג"
הלכה למעשה, הרי כל החשש הנ"ל אינו נוגע לענינינו, כי כ"ק האדמו"ר מקלויזנבורג כתב עוד דברים וז"ל, "ואולי ס"ל להגר"ש קלוגער, שגם שרי העיר מחמת דינא דמלכותא חשיבי כבעה"ב וכפי שביאר הר"ן בשם התוס' בנדרים דף כח מפני שהארץ שלו וכו' עי"ש, ולפי זה צ"ע אם שייך הך גדר גם בשרים שבזמנינו", עכ"ל. "DOVID asks a simple question: if hilchos eruvin was so simple why didn't the SR know it"
I know its difficult for you to wrap your little head around this fact, but he needed time to answer simple issues. דהנה בדרשתו לפני בחורי תו"ד, כאשר הגר"י בעלסקי סיפר להם מעשיה זו, הוסיף אז פרט שלא הזכירו כאן בתשובתו הגדולה, והוא פרט חשוב מאד הנוגע לענינינו, שהרב מדעברעצין זצ"ל עבד אצל הרה"ג רמ"מ כשר, לסייע לו בעריכת ספרו "תורה שלימה" במציאת מראי מקומות וכו'. והואיל ופרנסה לא היה לו מזה שעבד אצלו רק כמה שעות בשבוע, הציע לו הרב כשר תפקיד נוסף לסייע לו לבנות העירוב במאנהעטען. והא ראיה משיחת הרה"צ רבי יוסף דוד מאסקאוויטש זצ"ל משאץ עם כ"ק האדמו"ר מסאטמאר זצ"ל, שנתפרסם ב"המאור (תשרי תשט"ו) ובמכתבו כת"י המודפס בקונטרס "מאז ומקדם" (מהדורה חמישית ומעלה) שלאחר השקו"ט בענין תיקון עירוב במאנהעטען, שאל את כ"ק האדמו"ר בזה"ל "רבי, אם אינך נוטה לזה, אמור לי ואפסיק מלעסוק עוד בדבר הזה, ושתק ולא אמר מידי. וכשנטלתי רשות ממנו, אמרתי עוד הפעם שיאמר לי הן או לאו, שכל בטחוני עליו. ואמר לי בזה"ל בשחוק על פניו: 'איך מיש מיך נישט', ובירך אותי". הרי שממה שלא הורה לו האדמו"ר מסאטמאר להפסיק מלעסוק בעניני העירוב דמאנהעטען, מוכח שעצם ענין תיקון עירוב לא היתה הבעיה. ואם היתה איזה בעיה, היא לא העירוב אלא ההתערבות עם חוגי הרב כשר וכיו"ב, שע"כ לא הי' ניחא לי' בחברותא של הרב מדעברעצין עמו ודו"ק. "D: "to the issue of large city eruvin"
הגר"י שטייף: ולפי"ז באופן זה אפשר לערב.. וביחוד העיר ברוקלין אפשר לתקן "שכונות שכונות" דהיינו אותם השווקים שדרים בהם לרוב מהיראים, בקל יש לתקן אותם "בצורת הפתח". ע"כ. -בתשובותיו סימן ס"ח"
I guess you are not capable of understanding what RYS meant. The teshuvah was written about Manhattan, and he simply meant that each neighborhood of Manhattan can establish an eruv independently according to all. E.g. Lower East Side of Manhattan, upper Manhattan. איסור להורות הלכה לפני רבו חל גם על "גדול הדור שאינו רבו" אפילו לא בא ללמוד בפניו. וכן נפסק בש"ע יו"ד רמ"ד. -תרומת הדשן קל"ח י"
Stam narish. Rav Fishel was not a Klausenberger Chasid. As an aside, the Pupa rav the Sharmesher rav, did not differ with Rabbeinu Yoel because they considered him Gadol Hador, but only because they where petrified to go against his edicts.